It’s nearly December, which means gifting plates of fudge to our neighbors, fancy holiday parties and ticking off the boxes of our kids’ lists to Santa. 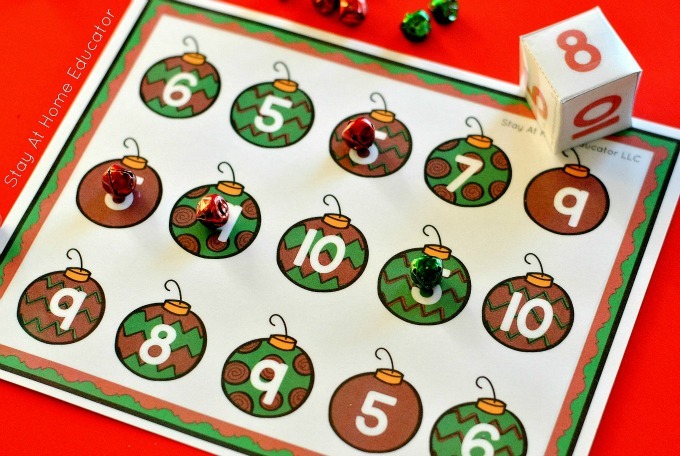 Our December theme in preschool is all things Christmas, so ’tis the season to keep the kiddies learning with a Christmas activity pack for preschoolers. I know the title says “playdough”, but really you can use these mats with small math manipulatives, too. I offered small bells, because who doesn’t love a little extra jingling this time of year? 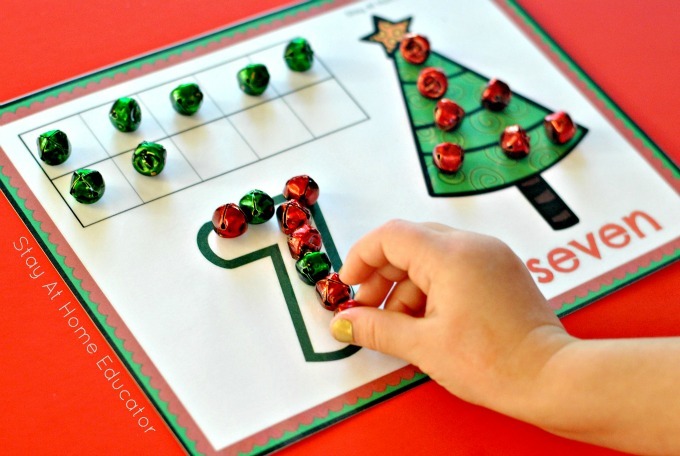 Each mat has a ten frame, a numeral with the corresponding number word, and a Christmas tree. 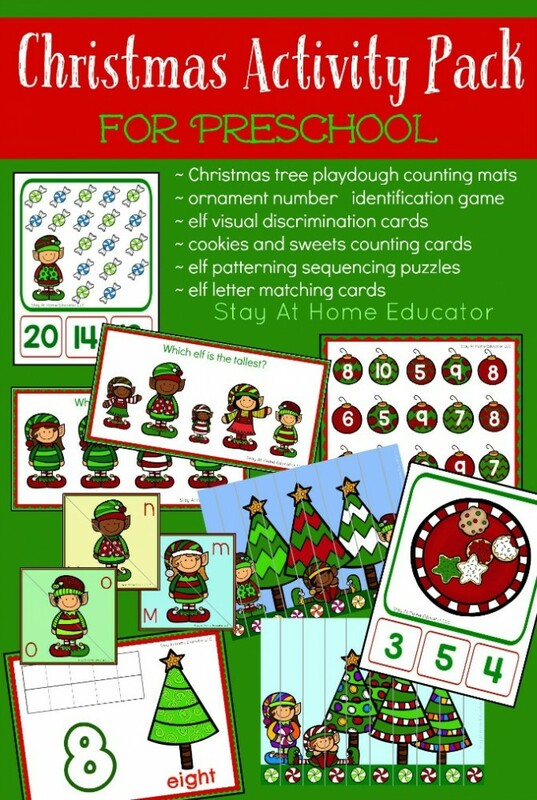 Your preschooler is sure to get a lot of counting and number identification practice with these fun mats. Don’t forget about all that fine motor work, too! I’m always looking for new fun ways to teach my preschoolers number identification. This game is just right! 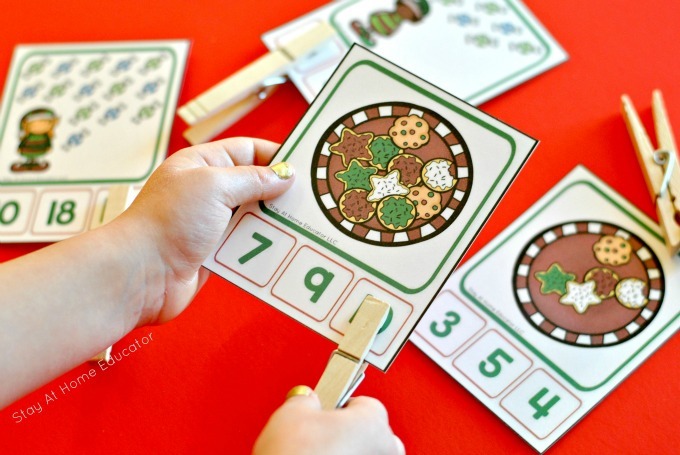 It can be played independently, or as a game with other preschoolers. Simply roll the dice, name the number, and cover the corresponding numeral on the game board. The first player to cover all their ornaments wins the game. There are two sets of games, one for numbers 0-5, and a second for numbers 6-10, and ten different game boards. These are not your typical discrimination cards were your preschooler simply matches like pictures. 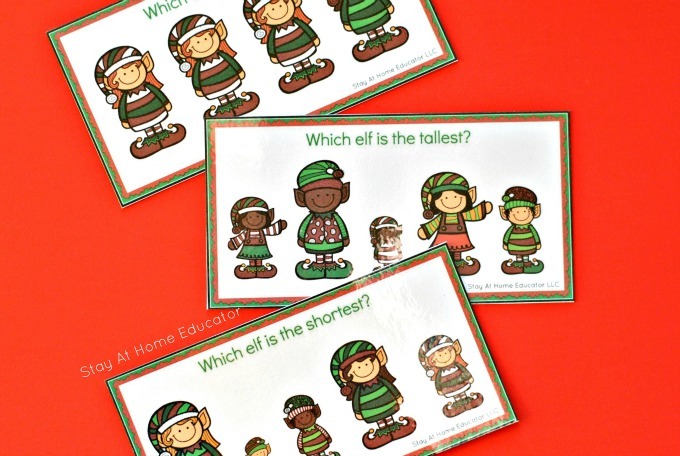 Instead, each card requires your preschooler to pick out a specific characteristic, like which elf is different, or the tallest, or shortest. There are 20 different cards with this set. These are my daughter’s favorite from the Christmas Activity Pack. One set of cards featuring counting practice 0-20, has an elf with candies, while a bonus set features cookies on a plate. Each card requires counting the cookies or candies and then identifying the corresponding numeral out of a set of three choices. I adore all those number sequencing puzzles where a cute image is broken into strips and the puzzles is self correcting because the child has to sequence numbers at the bottom of the puzzle. 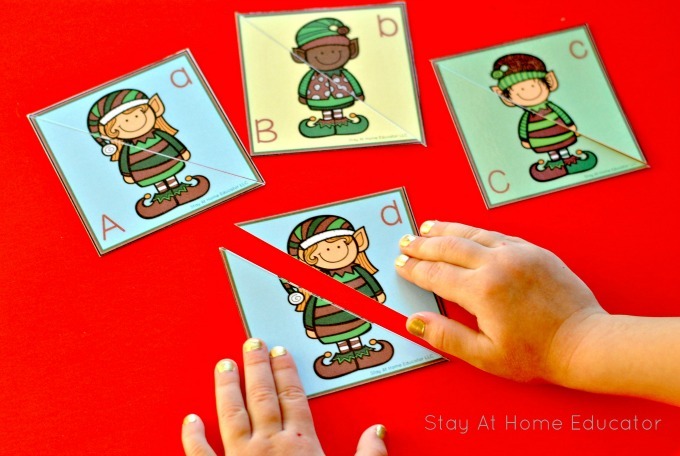 Well, I’ve taken it one step further with these elf pattern sequencing puzzles. Instead of sequencing numbers at the bottom of the puzzles, the child has to identify the pattern and work from there. The puzzles feature AB, ABC, and AAB patterns. This activity includes eight different puzzles. 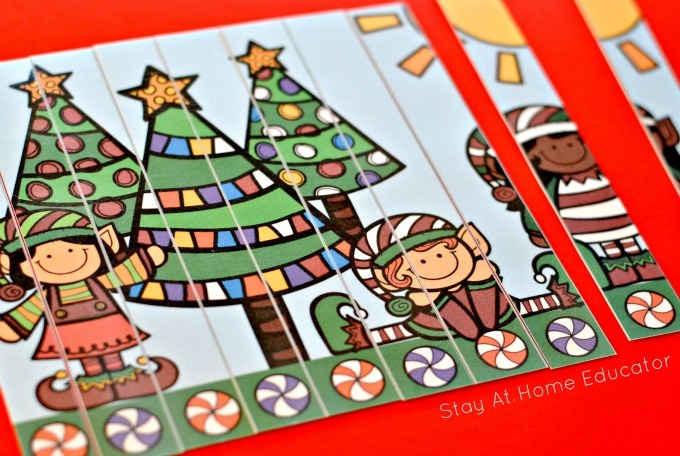 The final activity in this super fun Christmas activity pack is elf letter matching cards. My preschoolers work hard all year long learning their letter names and sounds, and these letter matching cards are the perfect way to practice matching upper and lower case letters. You can pull out only the letters your child has been introduced to, or you can offer the entire alphabet, or other sets of your choice. These matching cards are an easy way to differentiate your preschool phonics instruction. I love all of the christmas activities.